After playing in the first three seasons of the new ABL with the Melbourne Aces McGrath signed with the Boston Red Sox after which he ceased play in the ABL following the 2012-13 season. He focused on his American play, reaching the Advanced A level Salem Red Sox in 2016. 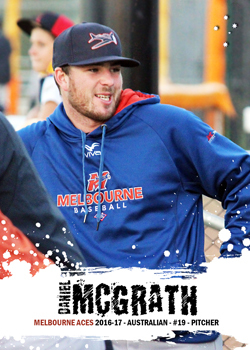 Obviously something happened discussion wise as McGrath was able to join Melbourne for the 2016-17 ABL season before heading back to Salem in 2017.